Whole Health Austin is an Integrative and Holistic Medical Clinic that operates on the common ground between Ayurveda, Traditional Chinese Medicine (TCM), our Microbiome, and Western Medicine. The thread that connects these sciences is our gut, and the type of medicine I offer based on this understanding is Integrative and Holistic Medicine. For thousands of years, Ayurveda and TCM have recognized and highlighted how healing starts in the intestines, gall bladder, liver, stomach and other digestive organs. Now modern medicine is catching up with what has been observed for thousands of years through work being done by pioneers like Dean Ornish, James Gordon, T. Colin Campbell, and Michael Greger. Their work shows how we can reverse heart disease, cure anxiety and depression, and reduce our risk of cancer. The irony is that I had to learn about their work after medical school and residency, because conventional medicine does not focus on lifestyle and nutrition which are synonymous with prevention. This is why I launched Whole Health Austin, so I could focus on lifestyle, nutrition and go beyond disease prevention to optimal wellness. 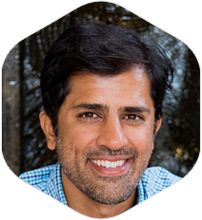 I am Darshan Shah, MD, and I pour my personal experience and passion for life into helping people improve their own physiology. What I have discovered on my own wellness journey is that moving towards a Whole Food Plant-Based diet has improved my health significantly. Specifically, I no longer have asthma or reflux symptoms. I have lost weight and feel more vibrant and energetic. What we do outside of work is as important as what we do in our professions. Traveling and hiking in the mountains makes me feel alive, and being able to share this passion with my family makes it that much more special. Here’s a short video from November, 2017, with my wife and daughter hiking to the base of Mt. Fitz Roy in Patagonia’s Los Glaciares National Park, El Chalten, Argentina.